Long before I ever imagined that I would come back to Europe and to Lyon to make my life in here, I was going through a strangely shiny and buffed rough spot in my 20-something life. I had the perfect job, complete with 1990s double breasted power suits and ridiculously high heels. My straight blond tresses were cut in a severe bob for which I took special trips to Hong Kong to have shaped by an expensive stylist every few weeks. I worked for a Swiss commodities trading company in Beijing, and worked very hard, traveling to Chinese ports and smelters, hard bargaining with the Chinese. I considered myself very lucky and secretly wondered when the other shoe would drop. Inside, I was a bit cautious and maybe secretly a bit too serious about life. One day, much to the dismay and perhaps the amusement of my colleagues and tragically bored expat friends, I found myself involved with a Chinese rock star with a tattoo in the middle of his forehead. Nights out, he paraded me about the capital city like a trophy and treated me like a rag doll. He was sugar daddy to an adoring fan/girlfriend in every Asian port, many of which circulated through Beijing to visit him. He just couldn't say no. He had no future and a sordid past. He was clearly insane. On our weekends, we did unheard of things like float down Beijing's waste canals in a rubber boat together. We hung out at the public pool near Tian Tan park. We rode horses and set off firecrackers like kids. We drank warm sake and play-acted various bizarre fictitious scenarios with a group of dramatic Chinese friends. He lived very dangerously. Sometimes these days I wonder if he is still alive. Anyway, he was a good companion because he was everything I was afraid to be. He forced me to fully live at that time. He was the one who shocked me into reality and dragged me out of the perfectly buffed shell I was in. He took me to the insect restaurant and ordered a bowl of scorpions. Without fanfare, he muscled me into doing what I really wanted to do anyway - to eat them. It was very strange, my fear, because I was never a person to turn down any opportunity to try a new kind of food. My psyche secretly swelled with the desire to do something like that when I heard the stories by my male colleagues who drank snake blood with customers and the likes. But there it was, this bowl of fried dark red scorpions, claws flaring, tails and stingers poised, waiting before me with a neatly placed pair of chopsticks. I felt myself vacillating between fear and exhilaration. The Chinese rock star with the tattoo in the middle of his forehead had the perfect instinct for just how far I would go. He knew I would eat one to meet his challenge, and then another. They tasted delicious. Not unlike fried soybeans. They'd been judiciously salted and I enjoyed every bite for so many reasons. A whole new world opened to me in constantly being challenged in his way. He was my best friend at the time. When I left Beijing, he cried and I just stared at him with the belief he was play-acting in my honor. He was never the one to do what was expected or correct, but at the same time I was thankful he mustered up some tears for me. I could not for the life of me feel any regret or sadness about what we shared or how we said goodbye. This vision of that moment at the restaurant came to mind when I opened my e-mail this morning, strangely enough. I had a message from Cate at the Well Fed Network. She says that the judges have finally done their work to choose the Top 5 Food Blogs in 18 different categories from a list of all of the nominations made in December. Guess what? Lucy's Kitchen Notebook is a Top 5 finalist in two categories. I feel sincerely honored to have been chosen by the judges to hobnob among the top notch. My Kitchen Notebook, being a low profile personal blog that doesn't get involved in memes or round-ups cannot hope to garner nearly enough popular votes to win. That's normal. I made this bed myself. However I'd like to say I'm really grateful to have been presented with such a challenge and an honor - being chosen as one of the Top 5 definitely opens up a whole new world for me. Just finding out I am a finalist is one of those bowl of scorpion moments! Am I going to take that leap and dare to strive for excellence? You bet. A big THANK YOU to the people who nominated me in December. I wish we had some pictures from those days! Lucy: Well, I'm sure floating down a polluted river with a Chinese rock star with a tatoo on his forehead can't possibly hold a candle to the excitement of being on the receiving end of a meme. In the meantime, congradulations on the nominations! I cannot tell you how much I think you deserve this nomination! Good luck! Et tres bonne annee 2007! Plein de bonheur! congratulations! the nominations are well-deserved! I agree with Bea. Lucy, you have one of the most interesting and layered blogs around. I only nominate winners! Just kidding, but seriously, yours is a blog i come to when I want to read, not just look at pretty pictures of food. Happy New Year Lucy! You are spot on, Ann. I came back just to reread today's wonderful post. This is one of my favorite places to visit. Well, I voted for you!!! Your past lives sound amazing, and you are a fabulous writer, what a jewel you are! Congrats-you indeed deserveto be in this position. You are an incredible writer-I know a winner when I read one! Congratulations! To win would be amazing but I think to be nominated is even better. I maybe just an echo but I consider you a winner. Yours is one I save for when I have time for a cup of coffee or tea and the time to let your words wash over me and soak in. 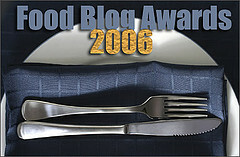 Hi Lucy, I've put you forward for the Bloggies as well.....for the best food blog and also for the best kept secret. I particularly like your blog because I actually cook from it and I couldn't say the same for most other food blogs. The writing and photography are elegant and the recipes work. I hope you don't object. Your comments mean the world to me. Thanks guys! Congratulations on being in the top 5, your really deserve it, I'm delighted for you. Whoops, that anonymous comment was me, and I meant every word of it!